The 24-hour Wellbeing vol2 in SEB Innovation Center in Tallinn had inspired and hopeful employers, amazing marketing gurus, talented designers, experienced developers, as well as real visionaries with a “can do” attitude and powerful ideas - all ready to change the world and bring in some new approach. In Estonia, there are around 100,000 people with lessened work ability out of whom, 50,000 do not have a job or a possibility to contribute to the society. "It is not OK that approximately the amount of citizens of Pärnu town can not equally live up to their dreams. 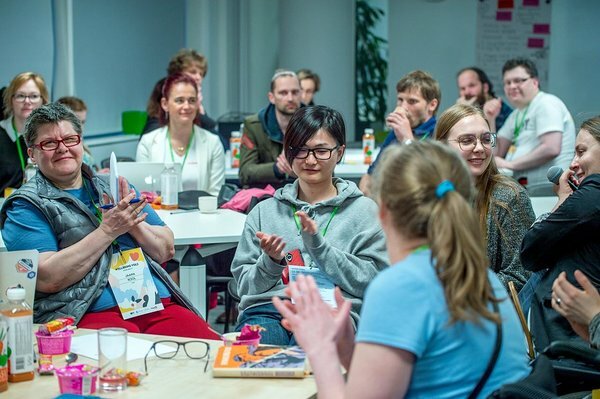 Every person is important, and every person can - within his capabilities - contribute to make Estonia a better place to live in,“ emphasizes the importance of the problem the Chief Specialist of the Ministry of Social Affairs and one of the mentors of the event, Sabina Trankmann. “Employers complain that there is a shortage of workers in Estonia, at the same time, we have thousands of people who are ready to reduce this deficit - we just have to give them a chance,” she added. 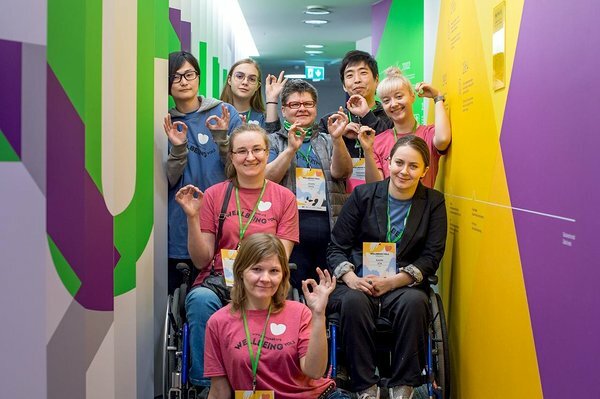 Two teams from the Idea Garage: Estonian Wellbeing (Heaolutalgud) in 2017 are already on their way to real success and quite well-known - HopeHolders (connects people in need of emotional support with peer experts) got a spot in NULA Incubation Program and Caremate, which brings together people with special needs with caregivers, reached the Top 30 in Ajujaht and has now reached the stage of testing its service. Garage48 Wellbeing Vol 2 Work Ability / Heaolutalgud Töövõime started with an interesting news made by Deputy Secretary General on Social Policy in the Ministry of Social Affairs Rait Kuus, who announced that a new measure (Innove SA) will be launched on 28 May this year, helping to develop innovative and promising ideas for up to 5 million euros. In addition, this new initiative would be supporting projects that would bring new solutions both to social welfare and to the lives of people with lessened workability. Help-a-Dot - an app for people with lessened workability. The idea is that if you need some help, you will ask for it through an app, people in your company will be notified and the fastest (more active) contributor can then go and help. The helper will get a "dot" (spot) and by the end of the month, the most helpful colleague can be awarded. GapLess - idea to create an opportunity for people leaving the labor market to find new jobs through their previous employer's recommendations. Namely, the existing employer brings out the skills and competencies of the employee. Best advert directly at B & B.
C-word - There are nearly 150,000 people with hearing impairments in Estonia who do not have the opportunity to communicate and understand ordinary Estonian speakers. The C-word is aimed specifically at a person with an Estonian-speaking hearing disability. Everything a speaker speaks about is a text-to-speech display on a smartphone. Tööhoidjad - The desire is to create an opportunity for people who, for example, have been on the sick-leave for a long time. This application could bring together workers, employers and professionals who, in collaboration with each other, can put together an action plan that would help a long-term sick-leave person to return to work or to the labor market. The main goal is to work on problem prevention, not the consequences. Be Well 2.0 - a platform where employers can seek advice about workers with special needs, mental or behavioral issues etc. So they could help the workers to adapt better. Multy-Talky. Anastasia lives in Estonia, but does not speak Estonian, which makes it hard for her to understand others. She wants to learn a language faster than the standard language course allows. Do to this, she wants to create a mobile application that will guide the person with the necessary knowledge of the language. A visage can be compared to Tinder, which is aimed at creating new friends. Garage48 Wellbeing Vol 2 Work Ability The winning team was an excellent team of Help-A-Dot, which is a great example of what can be achieved with a clear vision, will and hard work. The team won the Valge Klaar gift cards and caregivers. Be Well 2.0, who won the Latitude59 tickets. All three teams will, if they wish, get some mentoring of Garage48 experienced experts, and thus the opportunity to move forward with their ideas more easily and in a supportive environment. 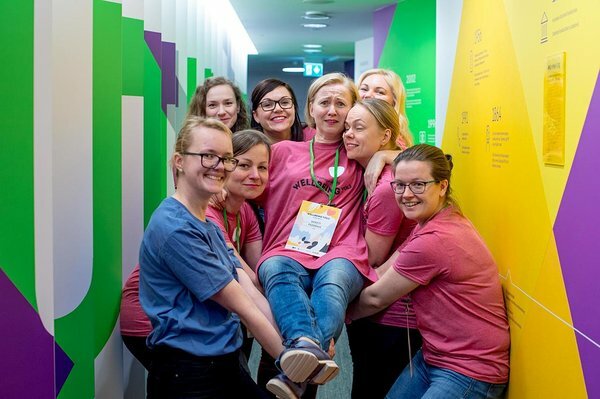 We could have not done it without Garage48's long-term mentors, as well as well-known experts in the social sphere: Martin Verrev (designer @Littlebit) and Katharina Skolimowski (designer @Nexd), as well as Maido Parv (designer @ Skype / Microsoft) and Peeter Marvet (zone.ee) helped with design and technical support. Tauno Asuja (chief specialist of the Estonian Chamber of Disabled People), Sabina Trankmann (Chief Specialist of the Employment Department of the Ministry of Social Affairs) and Arne Kailas (Head of Employment Policies of the Ministry of Social Affairs) advised their long-term experience in the social sphere. Thanks again to all the participants and we look forward to meeting you with the following hackathons! The event took place thanks to the initiative of the Ministry of Social Affairs and European Union Social Fund.